As I mentioned previously, this past year has been a whirlwind of activity for Ryley. But the fun didn’t just stop after the photo shoot, killing a buck or catching a muskie. Oh no, things continued to happen for Ryley throughout the Winter and into the Spring. Left: Ryley's SWS Kids blurb. Right: Ryley's BL Headliner blurb. Ryley submitted his awesome 53 inch muskie to the International Game Fish Association and was accepted into their exclusive muskellunge trophy club. From there Ryley had one of his striped bass pictures appear in January 2016 of Saltwater Sportsman in their “Salt Water Kids” section. Not only did Ryley appear as a SWS Kid but he was also honored to be included in the April 2016 Boy’s Life magazine as a BL Headliner. That makes three magazines in one year. Or as Ryley likes to call it, the year of the magazines! 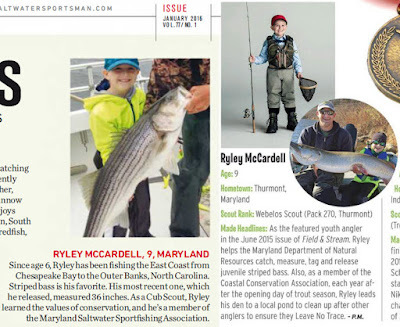 If that was not enough earlier this year we received word from the New Jersey Division of Fish and Wildlife that one of Ryley’s muskie photos had been chosen for their kids fishing photo contest! Ryley was invited to head up to the NJ Pequest trout hatchery for opening day of trout season on April 9th. So for the second time in a year we headed back up to NJ. Ryley with his award and new fishing pole and reel. While at the hatchery Ryley was given a certificate of appreciation along with a rod and reel combo. To top it all off he was allowed to fish in the hatchery education pond which was fully stocked with some behemoth trout! The fishing was slow at first. We were only allowed to use barbless hooks and night crawlers which made it nearly impossible to get a good hook set as the wind was keeping the lines slack. Ryley was becoming increasingly frustrated with his inability to hook into a fish. Ryley sitting on top of our Engel cooler waiting for a bite. Things only got worse when he did hook a fish because of the barbless hooks. Even the slightest mistake would relieve the pressure on the hook and the fish would come off. But things picked up as the wind died down. Ryley managed to bring a nice quality fish to shore so that I could net him and then dear old Dad moved the rod too quickly and broke the 2 lb test leader. But all was not lost. Ryley managed to fish the next couple of hours and bring in 9 trout and we decided to keep only the biggest and release the rest. Ryley with his three trout measuring 17 to 19 inches.